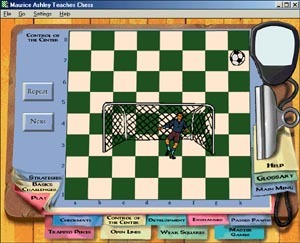 Several years ago, Maurice Ashley (now a chess Grandmaster) collaborated with publisher Simon and Schuster to release a educational CD-ROM titled, "Maurice Ashley Teaches Chess." The CD was an instant hit and was the rave in scholastic circles. Certainly, the project was ground-breaking and still remains as one of the most comprehensive learning aids in the chess genre. The CD-ROM is a multimedia guide to chess featuring basic rules, strategies and useful exercises to test one's knowledge. You can also choose to test what you've learned by playing the three-level (easy, medium, difficult) software component… the difficult level appears to be at least master level. What makes this CD different from others is GM Ashley's trademark enthusiasm and exciting sports analogies which makes learning chess both easy and enjoyable. Each of the prescribed lessons is prefaced with introductory comments by GM Ashley. The interactive challenges are very instructive, enjoyable, and will hold the attention of most children. Stephen Muhammad, a successful chess instructor and Master player, has shown the CD to his students and it was accepted with warm enthusiasm. If I had to choose one component that I found particularly intriguing it would be the 10 Grandmaster games annotated with GM Ashley's commentary. Some of the classic battles feature champions of the past such as Paul Morphy, Emmanuel Lasker, Wilhelm Steinitz, Vassily Smyslov, Mikhail Botvinnik, Mikhail Tal, Boris Spassky, Bobby Fischer, and Garry Kasparov. What so beautiful about these games are not only their historical importance, but the way that GM Ashley is able to bring the games to life with such vivid detail. It's almost as if one is actually there at the tournament watching the games in progress. One of my favorites would be Steinitz victory over Von Bardeleben which ended in a 10-move combination. In the midst of the combination, Ashley appeared as if he were calling a boxing match as he accented Steinitz' devastating moves as "vicious body blows." His commentary is filled with easy-to-follow analogies, and chalkboard diagrams to indicate particular themes. Truly classic commentary and no one does it better than GM Ashley! 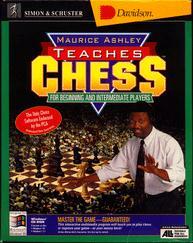 While the CD has a 1995 copyright, it is still a wonderful learning aid for someone learning chess. If you know of anyone who wants to learn chess (of is intimidated by the challenge), get them a copy and watch the CD work its magic! If nothing else, get your own copy as a useful addition to your chess library. Enjoy! Pictured above is one of the lessons on control of the center. The illustration shows how a soccer goalie positions himself in the center of the net for maximum mobility. The tabs below explain additional themes such as development, exchange of pieces, open lines, and weak squares.